Researchers are using biological glow sticks and finely-tuned cameras to look deeper within cells. Fireflies are easy to find at night — but not in the day. Their tails glow bright in the darkness. Yet, in sunshine, it’s difficult to compete with everything else. 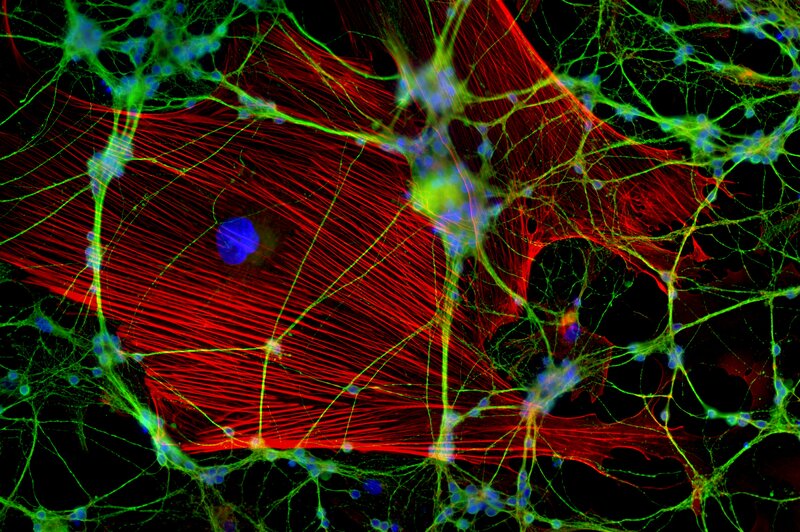 By using the same concept of pinpointing objects in the darkness with emitted light, fluorescence microscopy has helped scientists look inside cells for more than a century. Unfortunately, that technology had a limit. Researchers could not look deep into proteins to see how the tiny molecular machines moved and interacted in living cells. Since proteins do many of a cell’s most crucial jobs — including fighting infections, carrying messages and initiating chemical reactions — poor image resolution has hindered the search for better medicines and keener insight into aging. 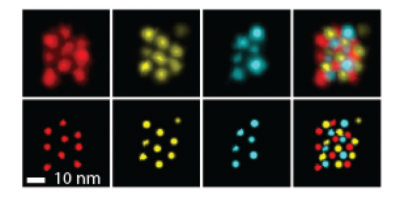 Under a conventional fluorescence microscope, proteins look like blurs of light instead of pinpricks, as if those fireflies were floating in a fog, grouped too closely together. But now that view may be sharpening. In a paper published in July 2016 in Nature Nanotechnology, researchers associated with Harvard University’s Wyss Institute for Biologically Inspired Engineering revealed their updated toolkit, called discrete molecular imaging, which can clearly locate and count individual sections of proteins just five nanometers apart, a distance 20,000 times thinner than a sheet of paper. Previous techniques could only distinguish between protein sections 10 to 20 nanometers apart. The improved resolution “is a game-changer,” says Katharina Gaus of the University of New South Wales, who is using the DNA-PAINT tool to learn how T cells in our immune system communicate with one another. DNA-PAINT uses complimentary strands of DNA that light up when joined. One strand binds to the protein of interest, and the other drifts through the medium until it encounters the first strand. When they meet, the fluorescent tag on the free-floating strand lights up. Looking through a microscope, the scientist sees this effect as pinpricks of light, then darkness as the strands separate, and then light once more, as the unattached strands play musical chairs. As part of the larger, updated toolkit, a camera records the blinking lights and a computer compiles the images to form a complete picture of the protein. It’s difficult to avoid blurring the composite image at this scale, so the Harvard team wrote an algorithm correcting the drift of the instruments to within one nanometer of accuracy. Other independent researchers echo Gaus’ enthusiasm. The Harvard team’s paper “demonstrates for the first time that [the direct visualization of dense protein clusters] could be possible,” agrees Mike Heilemann of the Goethe University Frankfurt, who also specializes in super-resolution microscopy. Biologists hope to use these new tools to locate the positions of amino acids in proteins and investigate age-old questions about our cells: how proteins fold, what enzymes look like and how the proteins embedded in cell membranes work. Previous technology required tiny, frozen, or crystallized samples — a set-up divorced from how proteins naturally exist in our bodies. But the new techniques will allow biologists to use live tissue and cells. When fully developed, these imaging techniques “could potentially improve all the ways people [analyze biological] samples,” suggests Mingjie Dai, the postdoctoral researcher on the Harvard team. Marissa Shieh graduated from Williams College with a B.A. in chemistry. She was a National Association of Science Writers Travel Fellow and a Jeffrey Owen Jones Fellow in Journalism. In hindsight, she realizes this was the only logical career after a childhood filled with National Geographic, Scientific American, and The New York Times. She loves Quantum Leap, Shakespeare in the Park, and MasterChef Junior. Her favorite punctuation mark is the em dash. You can follow Marissa on Twitter here.